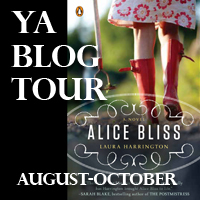 Kellee and I are thrilled to be part of the Alice Bliss YA blog tour! Thank you to Penguin for supporting this and Liza Weimer for coordinating it all. This is a book that Kellee and I both loved and are excited to be able to share with our readers! Goodreads Summary: Tomboy Alice Bliss is heartbroken when she learns that her father, Matt, is being deployed to Iraq. Matt will miss seeing Alice blossom into a full-blown teenager: she'll learn to drive, join the track team, go to her first dance, and fall in love—all while trying to be strong for her mother, Angie, and her precocious little sister. But the phone calls from her father are never long enough. At once universal and very personal, Alice Bliss is a profoundly moving story about those who are left at home during wartime and a small-town teenage girl bravely facing the future. What Kellee Thinks: I went back and forth between a 4 and a 5 for this book, but overall the story won me over and I had to give it a 5. The story is emotion-packed, filled with beautiful, descriptive writing, and includes some of my favorite male characters. Matt Bliss, Alice's father, is the center of this book without actually being in most of is. In the first section of the book, Matt is deployed to Iraq leaving his wife and two daughters behind. Though we don't know him for every long, it is made quite clear that he is an amazing person. I love when the father figure within a book is a positive presence as I feel that too often in young adult books parents, especially the father, are shown to be the bad guy when we all know, as adults now, that more likely they are just trying to protect their children. In this book, Alice loves her father and he is only shown in the positive light that you hope your daughter would have of you. The other character I loved was Alice's best friend Henry who was such an old soul. He is a great teenage boy character and you love him almost instantly. Along with this truly realistic father figure and a wonderful friend, Laura Harrington has included a cast of believable characters within a story that is happening across the country as we speak. It will touch anyone who reads it, but will especially be special for those going through a similar situation as Alice's. My only issue with the book was the point of view. I normally understand why authors make a certain choice for POV and even if I don't understand why, I can usually get used to the style; however, in this book I never found myself flowing along with the transitions within the narration. The POV is 3rd person omniscient and switches the focus of the narrator throughout. I wish that it had been 1st person (even alternating) or 3rd person limited. This is the 2nd book that I've had trouble with the POV choice, but I am glad that this time it didn't affect the impact of the story too much for me. The story still was poignant and emotional and I found that I could ignore my trepidation because I loved the characters and story so much. What Jen Thinks: I agree with Kellee that I definitely had to get used to how the narration changed from describing one character's feeling to another's from paragraph to paragraph sometimes. It kept me on my toes as a reader. It was unique but I do see how, as a reader, I liked being able to see inside all the character's heads. I particularly loved being able to see inside of Henry's head. The novel seemed to mainly center around Alice and her story but we did get to see into the other character's thoughts and feelings. Speaking of Henry, oh, how I love Henry! I just love him. I love Henry's relationship with Alice and I love that he is there for her. It seems like there a childhood boy-girl friendship can go a few ways: they stay great friends, they never talk to each other/become enemies, they become boyfriend-girlfriend. I love the stories when they either stay friends or they become boyfriend-girlfriend. A childhood friend is a special kind of friend who really does seem to know you in a different way from newly-met friends. It's so interesting how long-time friends know us in a different way. I love the connection that Henry and Alice have. I'm so glad she has him to support her in so many ways. I have a special place in my heart for soldiers/military/veterans or characters who have friends or family members who are soldiers, in the military or are veterans because my dad is a Vietnam veteran. I was born after his experience in Vietnam but I grew up seeing the traumatic impact the war had on my dad. Alice Bliss brings what current families might be experiencing to readers and gives us some perspective, insight, and hopefully empathy. My favorite part of this book is how Laura Harrington describes the raw emotions Alice and her family experience. There are so many ups and downs throughout the book and Laura takes readers along the the ride and allows them to see into the character's thoughts and emotions. "What's your new favorite word?" Gram asks. Writing Prompts: Write about a time in your life when you felt like you were taking on a new responsibility or that you did something independently for the first time. Laura Harrington is an award-winning playwright, lyricist, and MIT professor. Her debut novel, ALICE BLISS, was published by Pamela Dorman Books, Viking/Penguin.